Quality Tip: Difficult request? Try the reference interview! Engaging the user in conversation (ie, the reference interview) can often elicit useful information, and help you formulate an effective search query,thus leading to a happy session. Librarian: I'll do my best--what do you remember? Librarian: What year do you think it was--the 60s? the 90s? Librarian: And what grade level do you think the novel was? For young children? (probably not) Young Adults? College/Adults? Librarian: Do you have a <library’s name> library card? Note: Librarian checked policy page and a library card number is provided for chatting librarians to use during the session. Librarian: Is this the book? Librarian: I'm glad I could help. Can I help you with anything else? Do you have any questions or comments? Comment to the blog, or send an email to Susan McGlamery, [email protected]. Tuesday's Tip: Remember to Use the Pull-Down Menu in the Policy Page! At the beginning of each reference session, always scroll through the Patron Info tab located in the lower-left corner of your Chat Monitor. There, you will see some important information that reveals the patron’s true location so you can access the Policy Pages correctly and efficiently, using the pull-down menu when needed. A student from Utah contacts the service. When the session appears in the New tab in the Chat Monitor, the queue says: B Utah/Dixie (UNIV OF UTAH). 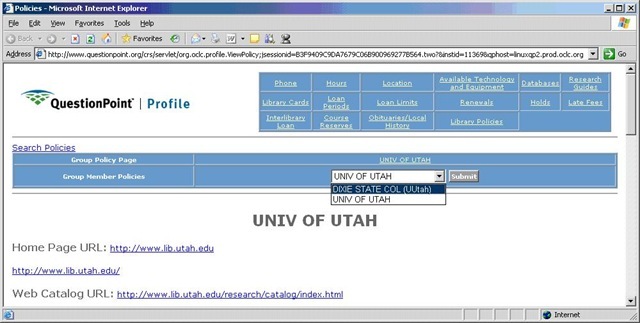 Once the librarian joins the session and scrolls to the bottom of the Patron Info tab, the librarian sees the lower-cased field entitled "library" (since the title is in lower-case, it indicates that the field contains information provided by the patron). As the librarian continues the reference session by asking the student some questions, he will have access to the Dixie State College of Utah’s policies and resources. 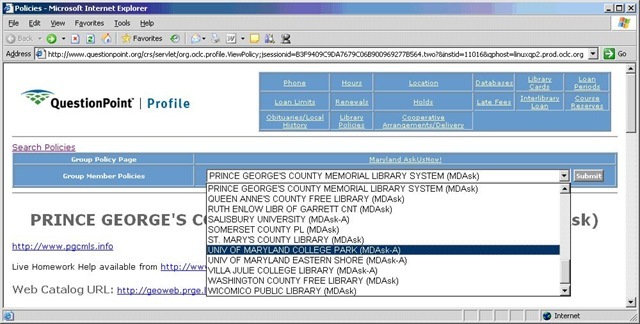 The Policy Page window will change, displaying the information provided by the University of Maryland, College Park. The chatting librarian can scroll down to the “Databases” section and retrieve the username and password provided by the UMD-CP librarians so he can view subject categories and the databases within them, as well as the full alphabetical database and e-journal lists. Then, he can continue the reference session by recommending specific databases and offering sample search queries using advanced Boolean logic. Diana Sachs-Silveira (project coordniator of Florida’s Ask a Librarian service) discussed "The Director's Chair", a YouTube contest in which Florida high school students produce a commercial for the Ask A Librarian service. Both speakers showed promotional materials from previous campaigns, including examples of bookmarks, posters, and print ads. In addition, both services are available through social networking sites: see QandANJ.org's MySpace page Florida's Ask a Librarian MySpace. Beth Cackowski described the process for producing an ad for cable, including meeting with the cable provider and hiring a video producer. Beth also shared budget information: $2200 to produce the ad, and $4800 to air it on MTV during the Music Video Awards, in the New Jersey cable market. Using PollDaddy, Beth reported that usage went up 50% the night the ad was shown, and 20% over the course of the next month. 500 people said they saw the ad on MTV. QandANJ.org is also running ads at movie theaters, at a rate of $10 per screen per week. Diana Sachs-Silveira discussed the Florida Ask A Librarian promotion on YouTube: a contest open to Florida high school students (9th - 12th grade) to develop the next Ask A Librarian commercial. Contestants should "make a creative and entertaining 30-second video that tells the world just how wonderful Ask a Librarian is", then load it onto YouTube, and the public will select the winner. See the Director's Chair for more information on the contest, and check back in late January when the winner is announced. Diana also discussed Ask a Librarian MySpace page, which contains (among other features) a chat widget that provides easy access to the service. The QuestionPoint development team has developed some techniques to reduce the amount of form-based Spam sent through your email reference form. Please note that these techniques are designed to limit Spam on email reference forms that you host on your library’s web site. We have two options available for blocking Spam. You may use both methods at the same time. Click on the Support form link when you are logged into QuestionPoint. The URL for EVERY instance of your email reference web form. You will receive an email within 1-2 business days confirming that your library has been added to the tool. If you have email reference forms submitting from a variety of locations into a single QuestionPoint account, the tool will need to know every possible location where form submission may occur. Once you receive this email, please contact OCLC Customer Support via email at [email protected] if your volume of Spam does not decrease or you receive complaints from your patrons related to form submission. When possible, be sure to note the specific problem URLs. The second technique involves making changes on your self-hosted form. Please have your webmaster contact OCLC Customer Support at [email protected] with your library name and Institution ID to receive the directions. For chat forms, if you currently host your own chat intake form and would like to limit any potential spam, we strongly recommend that you convert to our OCLC hosted chat form model. This is only available for libraries that have fully transitioned to the librarian “Flash Chat” interface. Please contact Carol Bonnefil of the QuestionPoint team ([email protected]) to discuss options. If your chat form is hosted by QuestionPoint, we will be implementing these modifications for you automatically. · FAQs, knowledge bases, etc. Please feel free to post comments and stay tuned for next week's Quality Tip! The past several Quality Tips have concerned Resolution Code selection. But equally important is how to actually assign a resolution code. Thanks to Stephen and Julie for sharing these tips! If you have a tip to share, just send a comment to the blog or email me at [email protected].